Great controversy existed in the first decades of the Christian era about Jesus of Nazareth. Many different gospels were preached and written about him, with many different epistles, and acts of apostles, and apocalypses. Most of these teachings and writings were considered to be (partially or totally) untrue by those who understood themselves as adhering strictly to the real "Gospel of God in Christ Jesus" in the true Christian church. Today the false writings about Jesus are sometimes referred to as "the lost books of the Bible." In fact, however, they were never lost and were never part of the Bible. They were forthrightly rejected by Orthodox Christians from the very beginning. The scriptures of God's final covenant with his people in his Son Jesus Christ came to be fixed for Orthodox Christians (after centuries of controversy) in the 27 writings that now comprise the New Testament part of the Bible. These are the scriptures that the Orthodox Church affirms as accurately witnessing to God's gospel in Jesus and to the faith, life, preaching, teaching and worship of his holy Church. As such, they are written witnesses to the Church's living "canon of faith" or "canon of truth" which existed before any NT scriptures were written. The Church's canonized NT scriptures affirm the OT writings canonized by the Jews, including the books now known as the OT apocrypha. These writings, taken all together, are what Orthodox Christians refer to as the Bible. The canonized NT writings also bear witness to the fact that the Bible did not "fall from heaven ready-made." Nor did God dictate the words of the Bible to any one person (as is claimed about Mohamed and the Islamic Qur’an), or to any number of persons. The Bible was written by many different divinely inspired human authors, at different times, in different places, for different purposes. The canonized NT writings also affirm that the "Word of God" is not a book, nor a collection of books. It is a living person. It is Jesus the Christ about whom all the canonized writings speak, and to whom all of these writings refer, each in its own unique way, according to the unique inspirations, intentions and purposes of their human authors. The canonized NT scriptures provide the true understanding of Jesus as God's Son and Word, the Messiah of Israel and the Savior of the world. They show how Jesus is the personal fulfillment and final interpreter of "the law, the psalms and the prophets" (Lk 25-27, 44-49) and all the OT scriptures which all speak about him. The OT Book of Psalms is the most used book of the Bible in Orthodox liturgical worship and personal prayer. It provides at least three quarters of the liturgy's verbal content. It is interpreted as being all about Jesus Christ and the countless aspects of his life and ministry as truly human and truly divine. The canonized NT writings, unlike the false writings, are centered on the passion, crucifixion, death, resurrection and glorification of Jesus. They identify him with the seed of Abraham, the Son of Man, Yahweh's Suffering Servant, the final Prophet, the High Priest according to the order of Melchizedek, and the Shepherd/King of the house of David whose kingdom, already spiritually and liturgically experienced in the Christian Church, shall have no end. Orthodox Christians always interpret the OT scriptures in the light of Christ. They hear and read the OT writings through the prism of the Cross, coming to know by faith and experience that every word of the OT writings is ultimately about Christ. And they hear and read the NT writings about Christ in the light of the OT witness to God's interaction with His people from the creation of the world and the call of Abraham to the coming of Christ, first "in the form of a slave" (Phil 4:5-11) in order to "take upon himself the sins of the world" (Jn 1:29), and then as the King and Lord of God's everlasting kingdom to come at the end of the age. According to Orthodoxy, therefore, the true understanding of the God-inspired scriptures is to be found in the Church of Christ. Such understanding can be fully attained only in the context of the Church's life and teaching actualized and experienced by God's grace in liturgical worship, ascetical striving, moral living and philanthropic action. Thus, the accurate understanding of the Gospel that was first lived in the Church and proclaimed orally, and then recorded in the Church's canonized writings, can be fully acquired only by those who keep God's commandments as interpreted, taught and fulfilled by Christ. Such understanding can be attained only by those who are sanctified by God's grace in Christ, by the power of the Holy Spirit who spoke through the OT prophets and who inspired the Church's living "canon of faith'' or "canon of truth" as well as her canonized Holy Scriptures. 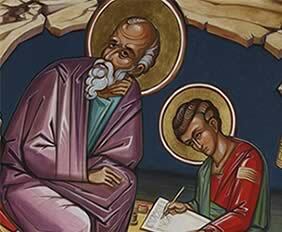 The first Christian writing canonized by the Church as being in accordance with the lived tradition and teaching of the Church was the apostle Paul's first letter to the Thessalonians. In this letter the apostle writes concerning what he calls "God's Gospel in Jesus" and "the Gospel of Christ" that was orally preached before any of the NT scriptures, including the four books that came to be called "gospels", were written. The "Gospel of God" to which St. Paul refers in all of his letters is not "from man or according to man", as he declares in his letter to the Galatians, explains in his letter to the Romans, and theologically and spiritually elaborates in all his letters which include his teaching about the being, structure, life, ministry and mission of Christ's Church in the world. 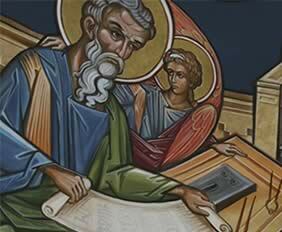 The Church traditionally attributes the letter to the Hebrews to the Apostle Paul. But from the earliest days of the Christian Church this was contested. While the content of the book is certainly understood to be in line with Paul's teachings, perhaps even being written by one of his devoted followers (like, for example, the learned Jew Apollos), it is most likely not directly from his own hand. This theological treatise (for that is really what it is) has to do with Christian worship in relation to OT worship as its completion and perfection in Christ. It is read at every Orthodox Divine Liturgy during Great Lent, including the feast of the Annunciation. Mark's gospel is written in the literary style of an "apocalypse". It is short, stark and sharp. It focuses on the clash between God and the powers of evil. No human being in Mark's gospel confesses Jesus as "the Son of God" except the Roman soldier at the Cross, while the demons confess who he is in the letter's first pages. The last twelve verses of Mark seem to be a later addition patterned on the experiences of St. Paul in the book of the Acts of the Apostles. If this is so, then the resurrection of Christ is witnessed to and proclaimed only by the angels, with human beings having only the witness of the empty tomb. 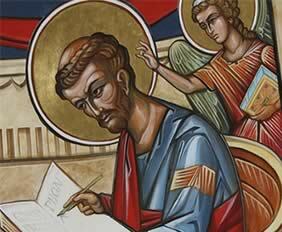 The gospel according to St. Luke is the first volume of a two-volume work, the second of which is the book of the Acts of the Apostles. These two books are written in the style of OT "history" which is not history in our modern sense of the word. The Lukan writings are an evangelical proclamation in historical form like the OT books of Kings and Chronicles. They show the universal significance of God's Gospel in Jesus. 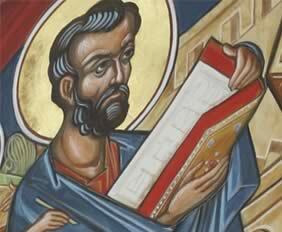 The gospel according to St. Matthew is the Christian "torah", i.e. the Christian "instruction" patterned on the five books of Moses, called the Pentateuch. The gospel is constructed in five sets of teachings. It portrays Jesus as the new Moses who gives the new law of the new covenant in continuity with and also in contrast to what was written in the law of Moses of old. Jesus is taken as a baby into Egypt to escape the murder of the infants. He is saved from slaughter. He then comes out of Egypt like Moses. He crosses the Jordan River, as did Joshua and Caleb. He is raised in Nazareth in Galilee where exiled refugees of the house of David settled. He begins his ministry by receiving the baptism of John after which he spends forty days in the desert at the end of which he is tempted by the devil. He then begins teaching his disciples, all of whom are Jews, and working “mighty acts" among both Jews and Gentiles. Like the gospels according to Mark and Luke, the center of Matthew's gospel is Peter's confession that Jesus is "the Christ" (to which Matthew adds "the Son of the living God") which occasions Jesus' first announcement of his forthcoming crucifixion and the command to his disciples also "to take up their cross." This leads immediately to Christ's transfiguration on a high mountain in the company of Moses and Elijah who stand for the law and the prophets, the dead and the living, and earth and heaven. This central event in the "synoptic" gospels (as the gospels according to Matthew, Mark and Luke are called because of their similarities in structure and content) as witnessed by Peter, James and John who are granted to behold God's glory in Christ before his voluntary passion. The gospel according to St. John (in which the word "gospel" is not to be found) is read in the Orthodox Church's liturgy during the 50 days from Pascha to Pentecost when ( theoretically) there are no catechumens or seekers in the gathering, but only the faithful who have accepted God's gospel in Jesus and thereby, through baptism and chrismation and the participation in the Holy Eucharist, enter into the eternal mysteries of God in Christ and the Holy Spirit. 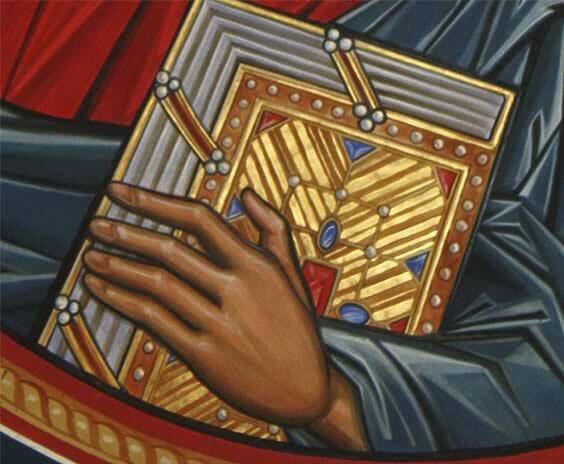 During this same paschal season the apostolic readings at the Divine Liturgies are taken from St. Luke's book of the Acts of the Apostles which provide, as in a verbal icon, a "historical" vision of the apostolic and evangelical activities of the first Christians. In addition to the four Gospels, the book of the Acts of the Apostles, the thirteen letters attributed to St. Paul, and the letter to the Hebrews, there are three letters and the book of Revelation (also called the Apocalypse) that are traditionally attributed to St. John the Theologian, two letters attributed to the apostle Peter, and one letter each attributed to James and Jude. Each of these writings testifies in its own unique way to the one "Gospel of God in Christ Jesus", and to what Jude's letter calls "the faith once and for all delivered to the saints" which Orthodox Christians claim is the faith of the Orthodox Church from its beginning to the present day. By God’s grace and mercy countless human beings can be graced and illuminated by reading the Bible. They are those who are truly humble, meek, merciful, poor in spirit and pure in heart, who hunger and thirst for truth, and who suffer for the sake of righteousness.